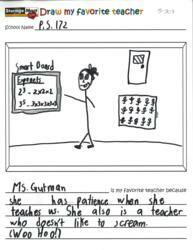 Ms. Gutman, of P.S. 172 Beacon School of Excellence in Brooklyn, NY, was voted the Grand Prize Winner in a contest hosted by StorageMart self storage. She will receive a $500 cash prize and over $3,000 in school supplies for her school. The student responsible for the winning drawing will also receive a pizza party for their class. StorageMart, self storage in Brooklyn, NY, is is pleased to announce the winner of the “Draw My Favorite Teacher” contest they recently hosted in Brooklyn, New York. By the very narrow margin of just 2 votes, Ms. Gutman of Public School 172 is the Grand Prize winner. Runners up include Ms. Rios (also of P.S. 172), Ms. Safford (P.S. 67) and Mr. Segarro (P.S. 20). “Draw My Favorite Teacher” was open to all public schools (K-5) in the Brooklyn area. Submissions to the contest were in the form of drawings made by students of their favorite teacher, along with a brief description of what makes him/her their favorite. Finalists were chosen from more than 500 submitted drawings and then put to a public vote via the official StorageMart blog and Facebook page. As the Grand Prize winner, Ms. Gutman will receive a check for $500 to spend on her classroom in any way she sees fit. P.S. 172 will receive a storage unit filled with school supplies valued at more than $3,000 and the student responsible for the winning drawing will win a pizza party for their entire class. StorageMart will present the award in an assembly on Friday, December 14th, 2012 at 9 a.m. The idea started when a teacher from a small school in New Bloomfield, MO approached us with a sponsorship opportunity to fund a smartboard purchase that couldn’t fit into the school's budget. I was inspired by this teacher's personal commitment to his students and the time and initiative he put into improving their education. There are teachers like him in every community, going beyond the call of duty because they want what’s best for their students. The ‘Draw My Favorite Teacher’ contest was created because we wanted to give back to teachers and at the same time enable students to be the mouthpiece for thanking them."